UPDATE X2: A LePage letter to now House Majority Leader Rep. Jeff McCabe (D-Skowhegan) is being added to this post. Frankly, with the two different pens and more scribbled appearance, it is harder to read than some of the others, but is related to bonds similar to that of the harshly worded one to Senator Patrick. You are a bald faced liar and cheat! Character eludes you. It is up to the Governor’s discretion on when bonds are sold, he has up to five years. Sometimes it is simply better to let the content tell the story. 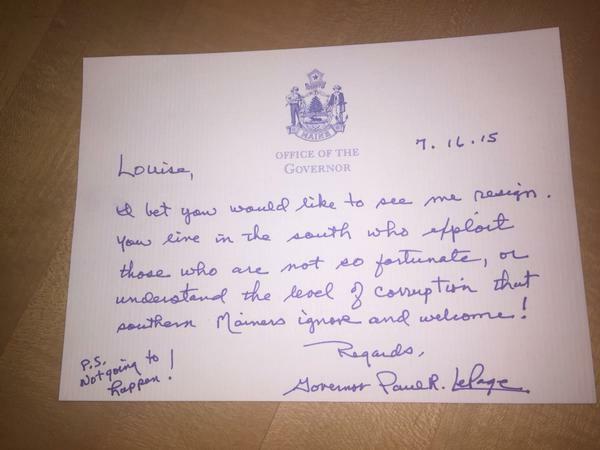 The governor wasted no time with his reply. 2. 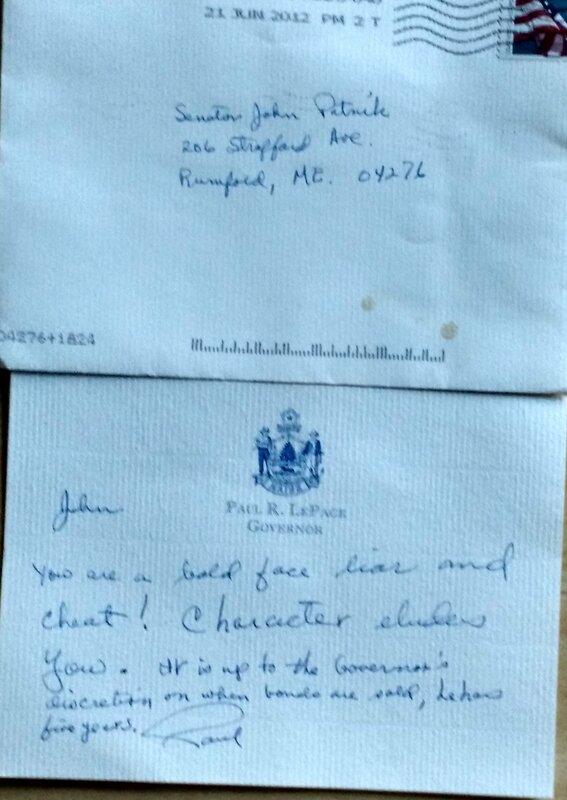 For handwriting comparative purposes, there is this 2013 note sent by the governor to Rep. Brian Hubbell (D-Bar Harbor). 3. 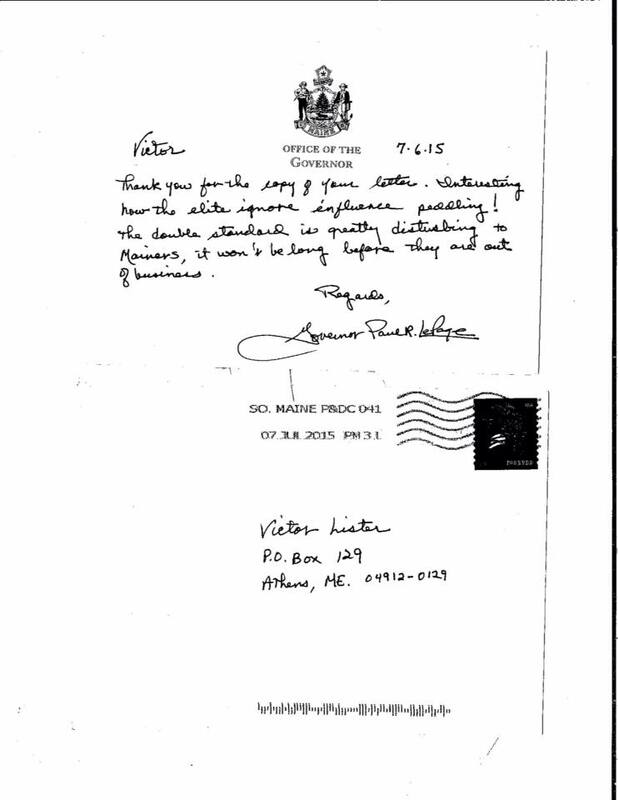 Governor LePage to supporter Victor Lister of Athens, dated July 6. “It’s time for the media to take the Constitution seriously. The paper has tyrannically silenced too many voices for too long, and it should watch its language. Why is Gov. Paul LePage called “bombastic”? I hear him denounced regularly, and I can’t figure out why. 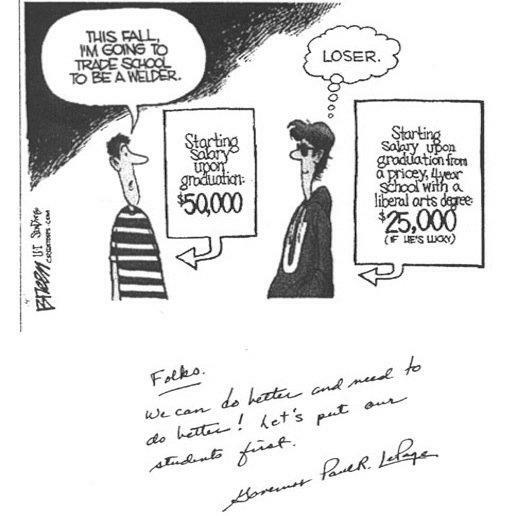 I don’t approve of “taking care of” legislators by making them heads of educational institutions. I’m a veteran and profit mightily from being one, but I question its cost to our nation. Clearly, we’ve entered the “Bread and Circuses” stage of decaying empires, and, though I personally profit from it, I think it is social diabetes. LePage is doing his darndest to put Maine on a diet; the least we can do is recognize the need. 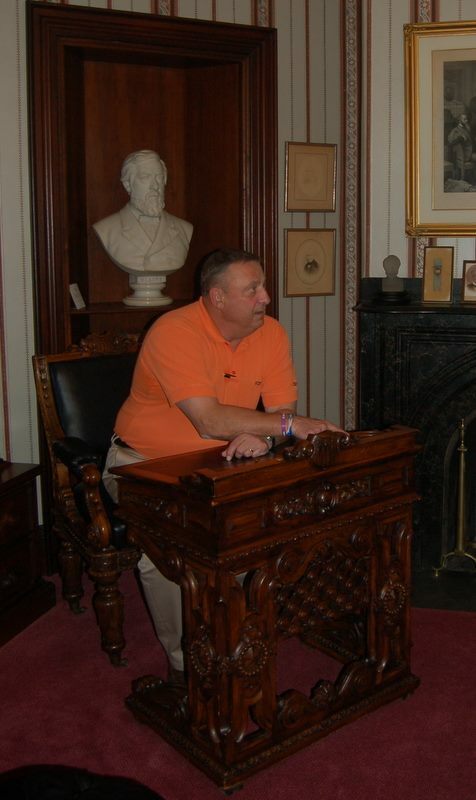 Governor Paul LePage sits at Governor James G. Blaine’s Congressional desk. Deborah Migneault, principal of Portland High School, said her first thought was: What did the governor pay for postage? Christian Elkington, principal of Massabesic High School in Waterboro, said he understood the governor’s point that vocational and technical education should be encouraged as an option, but disagreed with the assumption that schools don’t do that already. “We aren’t forcing kids down one path or another,” he said. 7. 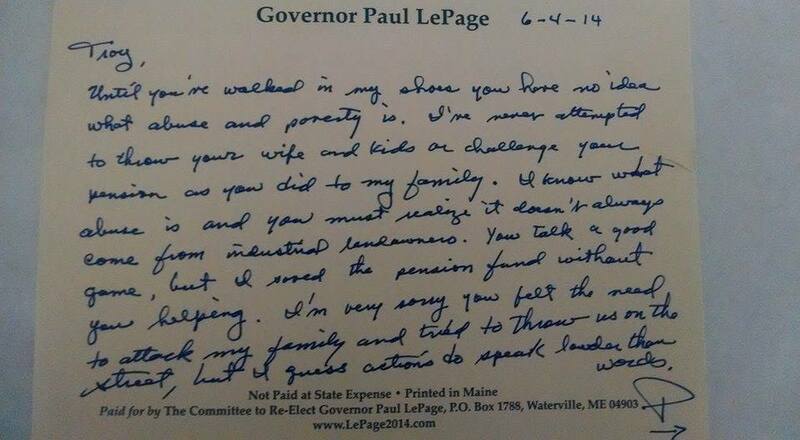 Finally is this note from Governor LePage on his 2014 re-election campaign letterhead to then Senate Majority Leader Troy Jackson (D-Aroostook). As the two share a “history”, no explanation from Bennett or anyone else on the second floor is needed, and unlike the above notes to Ms. Sullivan and Mr. Lister, this was not in response to a letter from Senator Jackson, but rather the governor taking the initiative to write first. Until you’ve walked in my shoes you have no idea what abuse and poverty is. I’ve never attempted to throw your wife and kids or challenge your pension as you did to my family. I know what abuse is and you must realize it doesn’t always come from industrialized landowners. You talk a good game, but I saved the pension fund without you helping. I’m very sorry you felt the need to attack my family and tried to throw us on the street, but I guess actions do speak louder than words. It is being reported that WGME spoke with Ms. Sullivan and that the segment will air later tonight, and that the governor’s staff will not be responding. 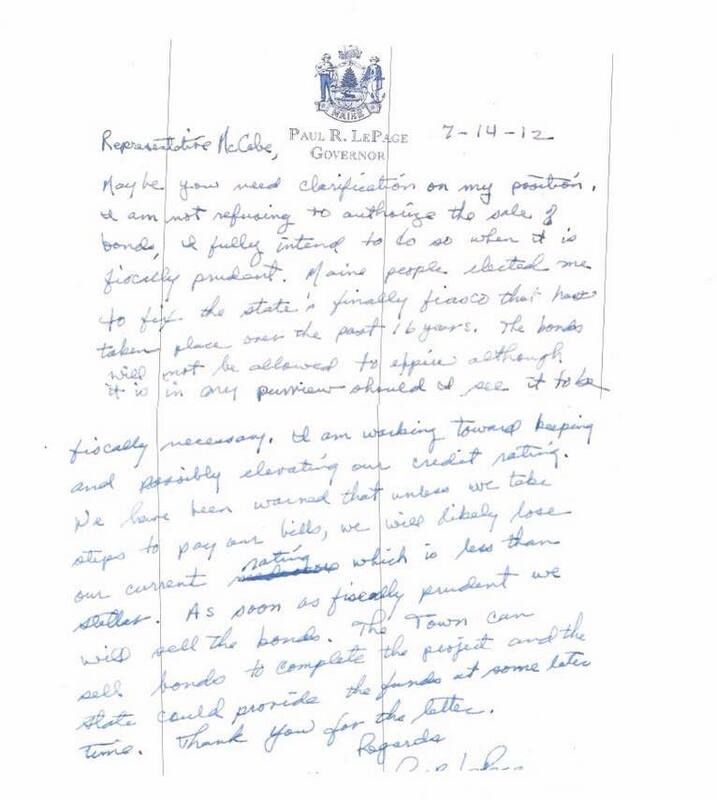 Neither LePage nor his staff apparently makes copies of his letters – even when the topic at hand involves state policy or other matters of public interest connected to his official duties as Maine’s chief executive. 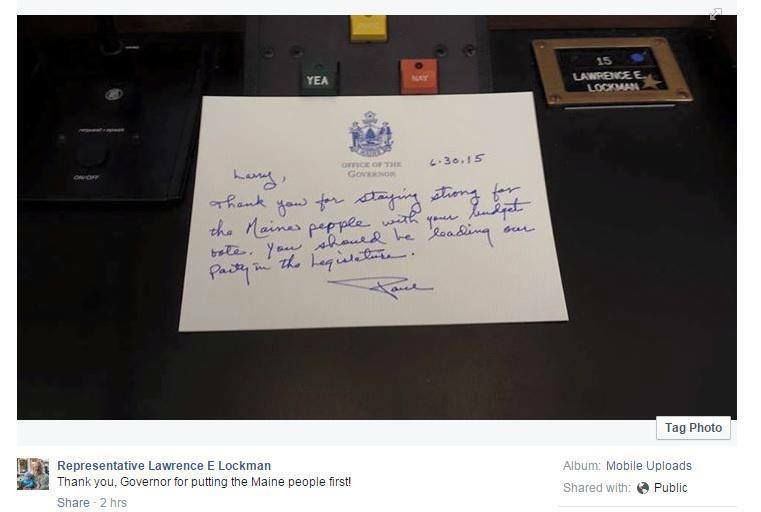 For example, LePage’s threat to strip Good Will-Hinckley school in Fairfield of $530,000 in state funding if it hired House Speaker Mark Eves as its next president was communicated in a handwritten note from the governor to the school’s board chairman, Jack Moore. Moore has said he may have discarded the note, and a copy was not among the documents the governor’s office released to the Portland Press Herald last week in response to a Freedom of Access Act request for all records related to the Good Will-Hinckley matter. 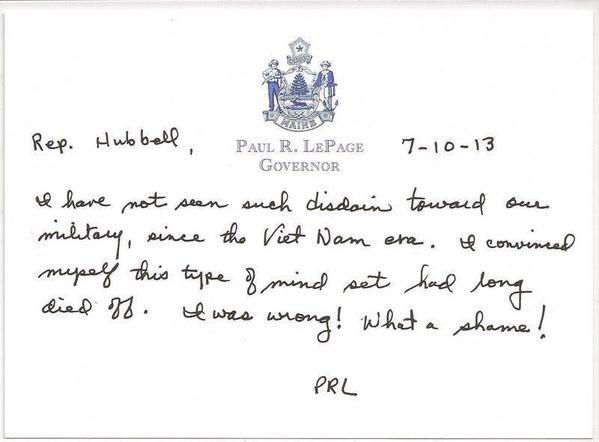 The administration has taken the position that LePage’s handwritten notes are not subject to the public records law because they are personal communications, not official business. But current and former state archivists disagree, as do experts on the Freedom of Access Act.